As usual the voting to choose the best architectural designs of buildings completed in Poland in 2017 took place in two stages. 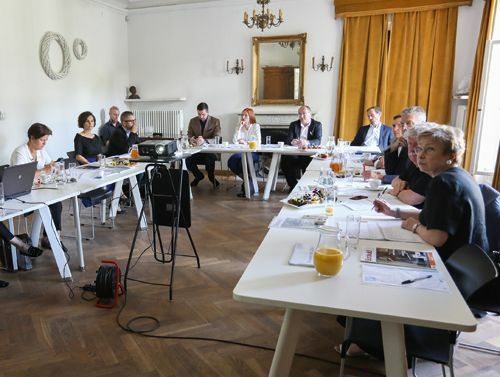 The first round took place at the head office of the Association of Polish Architects in Warsaw (SARP) on September 6th. At this stage, the architects on the jury, drew up a shortlist of three nominations for each category: Office Building of the Year, Eco- and User-friendly Facility of the Year, Public Space of the Year, Revitalisation of the Year, Residential Development of the Year, Shopping Centre of the Year and Workplace Solution of the Year. In the second stage of the voting (on September 12th), the full jury had their say to select one winning project in each category. Also it was decided to honour the investors behind one of the projects submitted with a special award. On September 19th, the results were announced and the prizes were awarded to the winners during the Architecture and Construction Festival. This year the prize for the Office of the Year went to a building on ul. Za Bramką in Poznań designed by Ultra Architects. In addition this year the jury decided to honour Wielkopolskie Centrum Wspierania Inwestycji the investor behind the project for, what Kinga Nowakowska, the operational director of Capital Park called, “its approach, which set a good example for other cities to follow”. The award for the Eco- and User-friendly Facility of the Year also generated a lot of discussion. The jury handed the prize to the second stage of the Warsaw Business Garden complex designed by JSK with the jury also praising the approach of the investor – Vastint – which had created a project certified with a high grade that was welcoming to both its users and local residents. The woonerf on ul. Zacisze in Łódź was the unrivalled winner of the Public Space of the Year. In fact, if there had been an eighth category – the Best Project of the Year – it would have also been its undisputed winner. The woonerf received the highest score of all projects in the competition – 8.5 points out of a possible ten. As it turned out, it was not the only prize to be awarded to a project from Łódź. The winner of the Restoration of the Year also comes from the same city, too. It captivated by breathing new life into a wooden house and tenement block on the corner of ul. Łowicka and ul. Przędzalniana 91. Only looking at the before and after photographs would convince someone of how big a change the restoration has proven to be. It was also the only project among the shortlisted nominations to include a wooden building. It proved a particularly hard choice to select the winner for the Residential Development of the Year. Residential developers have increased the number of their construction projects, which meant that over twenty projects were submitted this year. But the prize eventually went to a project in Wrocław designed by Maćków Pracownia Projektowa, which was built at ul. Witolda 43. The opposite problem bedevilled the Shopping Centre of the Year and due to the limited number of buildings that had been constructed, it was decided to also consider centres that had been built in 2016. The design of Wroclavia created by IMB Asymetria Architekci took the prize. The jury was particularly impressed by how the mall’s design had met the challenges of its city centre location and especially impressive was its underground delivery area. The centre also includes offices and an entertainment centre. The Workplace Solution of the Year was also a difficult prize to award with almost as many entries submitted as for the Residential Development award. A certain search engine has clearly set a trend with the fit out of its office space and this interior design style seemed to dominate many of the entries in this year’s award. The jury opted to honour projects for their consistency in style and for staying true to a central theme. The CEDC International office project by Trzop Architekci in the office building at ul. Bobrowiecka 8 in Warsaw was eventually singled out from all the office designs entered. The jury was impressed by the materials used and the recurring leitmotif referring to the company’s operations. The two other finalists could also stand proud as the winning design only beat the project in third place by 2.8 points. Agnieszka graduated in architecture from the Warsaw University of Technology and completed a post-graduate course in Project Management at the Warsaw School of Economics. She also completed a real estate management course at the Warsaw University of Life Sciences. She is currently employed as a director of the APA Wojciechowski architectural studio. Since 2010, she has been a licensed BREEAM assessor and has been a registered LEED green assessor. She is a co-founder of the Polish Institute for Ecological Building and has been a member of the Executive Board of the Polish Union of Architects [SARP] since December 2015. Aleksandra Zentile-Miller is a director in the Polish practice of Chapman Taylor and specialises in mixed use commercial projects. She has worked in many different countries, but since the early 90s her focus has been on the CEE region. She is currently responsible for business development in Poland and managing the Warsaw office. She studied architecture at Gdańsk Polytechnic and the University of Westminster in London. She is a member of the professional bodies of both countries (SARP, RIBA, ARB) and has taken an active part n the International Council of Shopping Centres and the Polish Council of Shopping Centres, of which she is a founding member and the president. Bartłomiej is an architect with twenty years of experience. He is a member of the board of the Polish Green Building Council. From 1996 to 1997 and 2002 to 2009 he worked in Berlin. He is the co-designer of the Polish Aviation Museum. After his return to Poland in 2009, he co-founded Horizone Studio in Kraków. Ewa studied architecture at the Warsaw University of Technology (1972–1977) and also studied at Iowa State University (1975). She presided over the team coordinating SARP’s competition jurors (2015–2019) and is a member of the National Chamber of Polish Architects. Michał is a member of the supervisory board of Pocztylion –Arka Powszechne Towarzystwo Emerytalne. He graduated in law and administration from the University of Warsaw and received an MA in civil and commercial law from the University of Tours in France. He also completed a postgraduate course in international trade law from the Centre de Droit du Commerce International. Between 1999 and 2003, he lectured in civil law at the University of Warsaw. Kinga graduated in law from the Sorbonne University in Paris. From 1997 to 2008, she was the general director of Call Center Poland, which under her leadership became one of the largest outsourcing multilingual customer service centres in Eastern Europe. Call Center Poland, which was part of the Communication One Group, was sold in 2007. Since 2007, she has been employed by the Capital Park Group – an investment company that operates on the Polish property market, where she is now COO and a member of the management board. With Capital Park Group, she has been involved in a number of major projects, including the Eurocentrum and Royal Wilanów office projects. Since 2009, she has also been the general director of ArtN, a special purpose vehicle owned by Capital Park Group, which is responsible for the revitalisation of the former Norblin Factory in Warsaw. Together with Dorota Czekaj and Kasia Wierzbowska, she founded and runs the Black Swan Fund, which invests in start-ups managed by women. Tomasz joined Griffin in 2007 and was involved with establishing and closing the Griffin Property Finance Fund, the first mezzanine financing platform dedicated solely to the real estate market. Tomasz is responsible for the entire office portfolio. He specialises in property finance and investment and has over ten years’ experience in banking, commercial real estate and project finance. He was a project manager at BPH Real Estate, having previously been employed by TDI (Towarzystwo Doradztwa Inwestycyjnego), where he was involved in corporate finance, company valuation, as well as the restructuring and privatisation of state enterprises. He graduated from the Warsaw School of Economics. Mark Kubaczka studied in London and Oxford graduating in 1985. He has been a chartered member of the Royal Institute of British Architects since 1987. In 2005, he gained a Polish architectural licence and became a member of the Mazovian Chamber of Architects of the Republic of Poland. Prior to Artchitecture, Mark was the international director of Denton Corker Marshall and the director of Fitch Benoy. He has been responsible for the design of award winning public spaces, mixed commercial developments, embassies, high-rise buildings, office buildings, residential developments, production plants and shopping centres in many countries. Mark has now been living and working in Poland for over 20 years. Olgierd graduated in architecture from the Warsaw University of Technology in 1971, and from the Warsaw Academy of Fine Arts in 1979. From 1974 to 1979 and 1984 to 1985 he was a tutor in the faculty of architecture at the Warsaw University of Technology. From 1984 to 1988, he ran an autonomous architectural studio together with Jerzy Szczepanik-Dzikowski as part of the ESPEA cooperative. In 1988 he became a founding partner of Jems Architekci. Michał has co-designed more than 600 projects, including 50 completed buildings. He became chairman of the board of Grupa 5 from 1998 to 2005 , and again from 2007 to 2008 and has now held the position since 2012. He lectures on architectural design at the faculty of architecture and urban planning at the Lublin University of Technology. Krzysztof is responsible for construction project administration having previously been the director of the shopping centre department. He graduated in architecture from the Tadeusz Kościuszko University of Technology. and started his professional career in the city planning office in Kielce. He gained further experience in architectural planning and project development in a number of companies, including Exbud, and he has also worked on projects for investors such as BP and Metro AG. He first joined Echo Investment in 1999 as an architect for the company’s retail, residential and hotel projects. Grzegorz is also a lecturer at the faculty of architecture of the Warsaw Technical University, and has written widely on architecture. He has written for monthly magazine Architektura–Murator since 1994. He was a judge for the Mies van der Rohe European Union Prize for Contemporary Architecture Award. In 2015 he became vice- president for creativity of the Association of Polish Architects. Rafal is the president and founder of the Polish Green Building Council (PLGBC) and the owner of Visio Architects and Consultants, an international practice that specialises in sustainable design and consulting. He is a licensed and registered architect, general contractor and civil engineer as well as a member of the Polish Chamber of Architects and Polish Chamber of Civil Engineers. From spring 2007 until autumn 2010 he was a lecturer at Harvard University for the environmental management graduate programme in sustainable buildings: design, construction and operations. Office of the Year came down to three buildings – one in Warsaw and two in Poznań. The winner was the Poznań building Biurowiec Za Bramką, designed by Ultra Architects team led by Marcin Kościuch and Tomasz Osięgłowski, which also included Kamila Dembińska, Przemysław Fedorczuk, Łukasz Piszczałka, Bożena Wróbel, Szymon Knast and Anna Lipiec. The project, which has 16,100 sqm of usable space, fills in a gap in the south-western corner of a city centre quarter. This location was the main factor that determined the form of the above-ground section of the project. Its façades form a contemporary composition that integrates with the other buildings in the neighbourhood. The shape of the building looks completely different from the inside of the quarter. Each floor recedes from the one below it, forming recreational terraces laid with wood and complemented by greenery. The completely glazed façade blurs the visual boundary between the inside and the outside of the building, allowing these zones to interpenetrate. Additional public space has been created on the ul. Za Bramką side, between the new project and the Poznańskie Centrum Świadczeń building. This is a small square featuring benches and greenery arranged in the same way as the terraces on the new building. The office building has seven floors. A car park with 299 mostly public parking and cycle spaces is located on the three underground levels and a section of the ground floor. The investor behind the project is Wielkopolskie Centrum Wspierania Inwestycji, while the general contractor was a consortium of Aldesa Construcciones Polska and Aldesa Construcciones. The competition in this category was fierce, with Biurowiec Za Bramką only winning by 0.3 points from Szucha Premium Offices in Warsaw. This project, which was designed by the Stelmach i Partnerzy studio, has 7,600 sqm of useable space on seven above-ground and three underground levels. The shape of the building has allowed the garden to be preserved, along with its old larches and chestnut trees. Green Property Group is the investor behind the project, while Erbud was the general contractor. The Bałtyk office building, at ul. Roosvelta 22 in Poznań, took third place. It is 65m in height and has 19,100 sqm of usable area. The design of the building is the fruit of a Dutch-Polish architectural collaboration: Rotterdam-based studio MVRDV’s team led by Winy Maas, Jacob van Rijs and Nathalie de Vries, and which also included Fokke Moerela, Roy Sieljes, Anton Wubben, Jaap Baselmans, Doris Goldstein, Maciej Grelewicz, Irena Nowacka and Brygida Zawadzka. And, on the Polish side, by the Natkaniec Olechnicki Architekci studio, led by Karol Olechnicki and Paweł Natkaniec, while Anna Piętocha, Karol Zdanuczyk, Maciej Faber, and Michał Zbytniewski also worked on the design. The investors behind the project are Garvest Real Estate Cooperatief UA and Vox Capital Group, while the general contractor was Porr Polska. The second stage of the Warsaw Business Garden complex was voted the most Eco- and User-friendly Facility of the Year Five office buildings with a leasable area of 56,000 sqm were developed together with a garden and roads by Vastint Poland. The design was by the JSK and the general contractor was Hochtief Poland. The second stage was LEED certified for Core and Shell and received a rating of ‘Platinum’ with a score of 86 out of 110 points. The Warsaw Szucha Premium Offices building, which was designed by Stelmach i Partnerzy, came second. The building is certified under LEED with a rating of ‘Gold’. The building features two charging station for electric vehicles, 13 racks which can hold up to 25 bicycles as well as lockers and showers. The building it lit throughout with LED lighting, which include motion detectors to turn off when no-one is present. Outdoor lighting is controlled by a timer and light pollution is reduced with the façade only being lit at the ground floor and entrance area. Third prize went to the Argon building, which is the third stage of the Alchemia centre developed by Torus in Gdańsk. The design is by APA Wojciechowski. The building is LEED certified with a rating of ‘Platinum’, for which it scored 88 points. Its ecological features include four beehives on the roof. The second place on the podium was taken by Chrobry Park in Gliwice, which was created by Visio Architects and Consultants. The park provides both sporting and recreational facilities for local residents and was restored and revitalised according to the design to once again become one of the most open and greenest areas in the city. The courtyard on ul. św. Pawła in front of the faculty of radio and television at the University of Silesia in Katowice came third. The project was designed by BAAS Arquitectura, Grupa 5 Architekci and Małeccy Biuro Projektowe. The prize for Revitalisation of the Year went to Wooden House and Tenement [Drewniany Dom i Kamienica] at the corner of ul. Łowicka and ul. Przędzalniana 91. The work was commissioned by the city of Łódź to a design by Paweł Krukowski with the collaboration of Angelika Mazurkiewicz and Agnieszka Kierys-Czernicka. The wooden building was designed by Piotr Brukarski and built in 1895 while the tenement dates back to the beginning of the 20th century. The two properties are social housing units that have replaced the former housing in the Księży Młyn cotton mill complex, which is also now being renovated. The renovation and revitalisation of the historic Main Bath and Carpenter’s Workshop [Łaźnia Główna i Stolarnia] buildings for the Silesian Museum in Katowice came second. The buildings were part of a former coal mine in Katowice and were revitalised by Tamex according to a design by P.A. Nova. The Praga 306 office, which was developed through the conversion of early 20th century industrial buildings in Warsaw's Praga-Południe district also took to the podium. The design was by APA Wojciechowski and the developer was White Star 2. The work included the façade (which was protected as a listed-monument) and the interiors (which were not covered by the conservation order). The Workspace Solution of the Year went to the offices of CEDC International in the office building at ul. Bobrowiecka 8 in Warsaw. The design by Trzop Architekci used waves of Żubrówka bottles to decorate the alcoholic beverage trader’s reception area. Bottles are also a dominant theme when entering the toilets and the central feature of the common area is a bar. Wine barrels are used as coffee tables and a bison is engraved in wood in the conference room. The co-working space of the Brain Embassy Mokotów at ul. Postępu 15 in Warsaw came joint second. It was designed by the Mode:lina studio and fitted-out by Artservis. Tremend in Warsaw's Wilanów district scored exactly the same number of points. The design was prepared by Magdalena Federowicz-Boule, Olga Stępień, Sylwester Petryka and Karolina Miernik. Maćków Design Studio was the architectural studio behind the Residential Development of the Year at ul. Witolda 43 in Wrocław. When the adjacent area, which had been reserved for a shopping centre, was re-zoned a large open space was created, which in turn resulted in a re-design of the housing area on the Kępa Mieszczańska island. The apartment building was developed by Nacarat Polska and constructed by Skanska. The second place on the podium was taken by City Corner on ul. Dzwonnicza in Ursynów. The architect of the 27 apartment development was Kaps Architects and the developer was Novdom and Totalbud was the general contractor. The third place went to the building at ul. Sobocińskiego 10 in Katowice. The 40-apartment building was designed by Amaya Architekci, FZ was the general contractor and BDInwestor was the developer. The building had to compromise the investor's expectations with the planning requirements of the local authorities, while the architects were looking to create a high standard apartment building that would fit into the local area. Additionally the designers had to consider the small size of the plot and the high groundwater level. This year Wroclavia, developed by Unibail-Rodamco-Westfield, is the shopping centre of the year. This year, due to the low number of mall openings, the competition was opened up to centres that had opened over the last two years. The centre was designed by IMB Asymetria Architekci, while the interiors were created by Paris-based studio Saguez & Partners. Wroclavia is a 173,000 sqm shopping and entertainment centre in the city centre. It has more than 180 stores and a car park for 2,200 vehicles. The building also includes offices and a bus station. The Serenada shopping centre in Kraków, which was developed by Mayland, came second. It was designed by Atelier.com (with the first concept having been designed by the AMC – Andrzej M. Chołdzyński studio). The design of the façade and the land development was the work of Wizja and Q-Arch, while Sud Architekt Polska was responsible for the interior design. The centre has a useable area of 69,500 sqm and was built by RD bud. Galeria Północna in Warsaw, which was developed by GTC, also took to the podium. Its design was created on the drawing boards of the APA Wojciechowski and the Moshe Tzur Architects studios. The 97,000 sqm building has 220 stores and 1,800 parking spaces as well as a rooftop garden.